Ever since I read Sharon Maas’s ‘Of Marriageable Age’ almost 15 years ago (it’s original release was in 2000! ), it has remained one of my favourite books of all time. Periodically I would check on Google and Amazon to see if I’d missed a new book that she’d written, and finally, my long wait has been rewarded, and does not disappoint! Thank you to Bookouture for sending me this ARC. 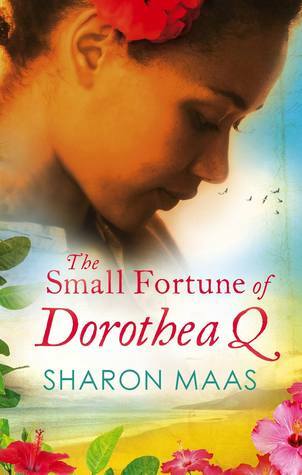 The Small Fortune of Dorothea Q is lyrical, atmospheric and poetic in its beauty! I stretched out the reading so as not to finish it too quickly, and so that I could drink in and retain all of it. It is a dense and multifaceted story and I felt the need to completely surround myself with it in order to fully appreciate it. The story unwinds in both Guyana (previously British Guiana) and London, and alternates between three generations of the same family. There’s cranky, stubborn grandmother, Dorothea, her daughter Rika, and her granddaughter Inky. Rika left Guyana 30 years previously, swearing she would never go back. But the past has a way of coming to find you, no matter how hard you leave it behind. Consequently, Inky has never met any of her mother’s family until Dorothea is deposited with them! It is a surprise for her to learn of family she’s never heard about, and to learn about her family’s history. Most of all about Dorothea’s closely held inheritance – a rare stamp – that she refuses to part with no matter what! Her incredulous question ‘You don’t know what an heirloom is?’ goes a long way to showing the disparity between the generations. We are led through the lives of rebellious, strong-willed, independent Dorothea, whose own family can’t seem to forgive her for being more of a Quint (that rowdy, tempestuous bunch! ), than one of her own; quiet misfit Rika, destined never to find her mother’s favour; and young, free-spirited Inky, struggling to understand the underlying currents flowing between her mother and grandmother. Gradually we come to understand the history that binds these generations together: the long-held disappointments and resentments, the jealousies and misunderstandings, and most of all the love and longing for what they’ve lost, and also for what can be re-built. This is a powerful tale that reminds us that even though we may leave our birthplace and all that is familiar to us to forge new paths our roots remain as strong as ever, no matter how hard we try to plant new ones in new places. It reminds us that blood really is thicker than water, and that no matter how far we may roam, we always carry home with us in our hearts.